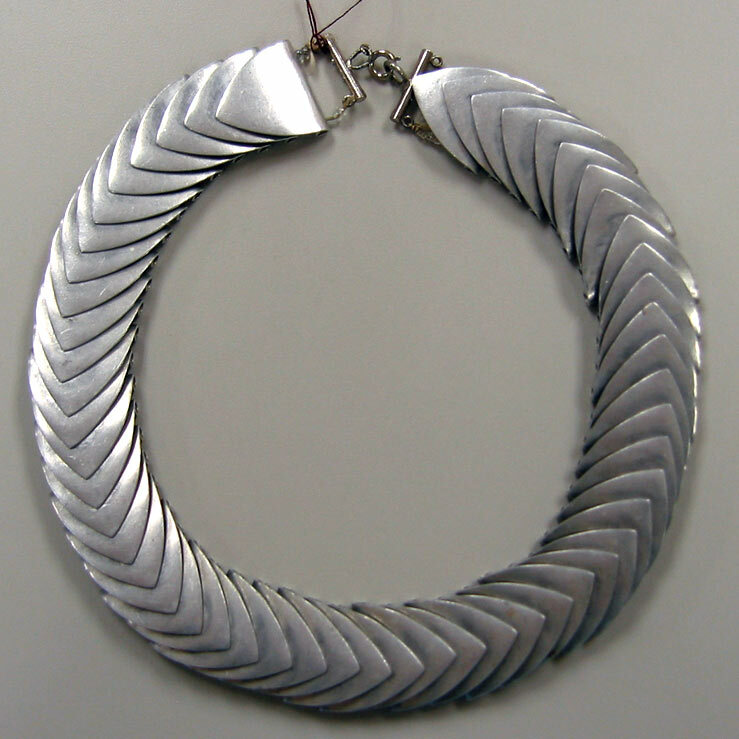 This aluminum necklace was on display at the Chemical Heritage Foundation (CHF) in 2010. A description of the exhibit is still available in a mostly image-free post about Atomic Age jewelry. Peruse additional wonders from the Chemistry and Fashion: Making Modernity exhibit. 0.75 in x 6.25 in. Sadly, CHF was absorbed by the Science History Institute in 2018. The collections can still be viewed in person, at the former location of the CHF Museum on 315 Chestnut Street in Philadelphia, Pennsylvania. You can still read about the illustrious past of the Chemical Heritage Foundation here. I have (mostly) found new source links for the in line URLs below. Interested in the legacy of Gordon E. Moore and his famous observation about the growth of technology? Read the original publication that introduced Moore's Law, Understanding Moore's Law: Four Decades of Innovation, that includes the original article written by Moore in 1966, and observations by Moore and others in 2006 when the book was published by (the now defunct) Chemical Heritage Foundation Press, to commemorate 40 years of Moore's law. The Science History Institute kindly keeps an electronic version of the full text (PDF) available for online readers. I first wrote this post in 2010. Andre Geim won the 2010 Nobel Prize in Physics. (Geim is actually a chemist, not a physicist, thus the relevancy here, if one wishes to be fussy; I do.) In the span of ten years, Geim went from winning an IgNoble prize for levitating frogs with magnets to the Nobel Prize for introduction of an extraordinary carbonate, graphene. During the 2000 IgNoble Prize ceremony, Harvard physics researcher and teacher Roy Glauber was present on the stage with Geim, as a long-time member of the IgNoble committee. Just a few years later, Glauber won the 2005 Nobel Prize in Physics! It is hardly enough to establish any sort of trend or correlation, but if this sort of overlap continues to occur, it might be something to look into.